Spirits of creative elite still patron Midtown luxury hotel. The beautiful Algonquin Hotel in Midtown. In 2012, the travel website, Oyster, named The Algonquin Hotel as the Best Haunted Hotel1, and rightfully so. The famed hotel opened in 1902 and has since developed quite the reputation for elegance, frights and history. According to local lore, the hotel is haunted by the ghosts of some of the greatest literary and theatrical geniuses of the 1920s, including members of the original “Vicious Circle”2. The Vicious Circle was first known as The Algonquin Round Table, named after “a specially-dedicated round table in the center of the hotel’s dining room”3. This is where famous creatives, such as Dorothy Parker, Alexander Woollcott, Franklin Adams, Robert Benchley, George S. Kaufman and Harold Ross, would meet to compete and bounce around ideas. Ross would found the prestigious American magazine, The New Yorker, with his wife, reporter Jane Grant, during one of these meet-ups in 1925. Thus, thanks to its pivotal role in shaping journalism history, the hotel was deemed a literary landmark on July 5, 1996. Welcome to The Algonquin Hotel! The level of paranormal activity in The Algonquin Hotel is just as high as its historic significance. Over the years, both employees and guests have reported hearing disembodied footsteps in empty hallways and spotting ghostly apparitions around the building, especially in the lobby and dining room. 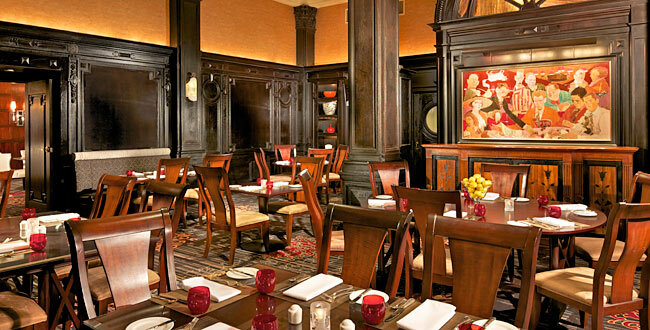 The dining room at The Algonquin Hotel. The Algonquin Hotel has been the epitome of comfort meets class since it first opened its doors on November 22, 1902. During the years of the horse and carriage, a next door, two-story stable was used to house guests’ steeds and buggies. The third floor had its own barber shop, supper club and rehearsal studio. As a result, the hotel became the ideal place for writers, theater critics and playwrights to gather. They first would host their creative parties in the hotel’s hot cabaret, but switched to the Rose Room4 in 1929. Under the leadership of Frank Case, the Vicious Circle was thus established. Frank Case was The Algonquin Hotel’s owner at the time, having purchased the hotel in 1932 for about $717,0005. Even with hundreds of rooms to oversee, he still managed to find the time to write (his works include a cookbook and Tales of Wayward Inn), raise a child (daughter Margaret was born in room 1206), host poker games and throw literary parties. 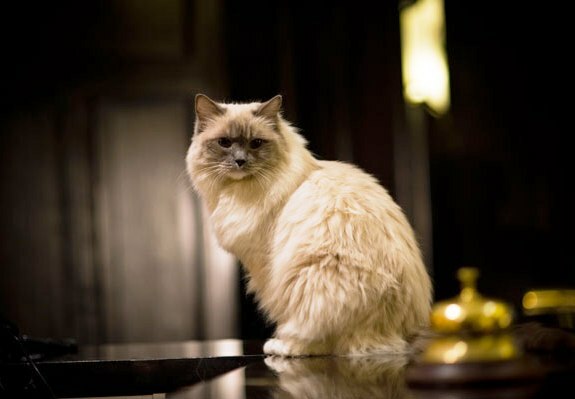 He was also known to be a huge cat lover – since his rescuing of a stray in 1923, the hotel always has had its own resident feline6. Matilda, the hotel’s current resident cat. The aforementioned cabaret at the hotel was first called the Pergola Room, but it was renamed the Oak Room in 1939. Before it permanently closed its doors in 2012, the Oak Room was satisfying hungry diners and launching the careers of the likes of Greta Keller, Harry Connick Jr. and Michael Feinstein. With walls of paneled wood, a beautiful grand piano and white table-clothed tables, it was the perfect place to enjoy a meal while listening to some live music. The Algonquin Hotel underwent a huge remodeling in 1998, during which the Rose Room was removed. 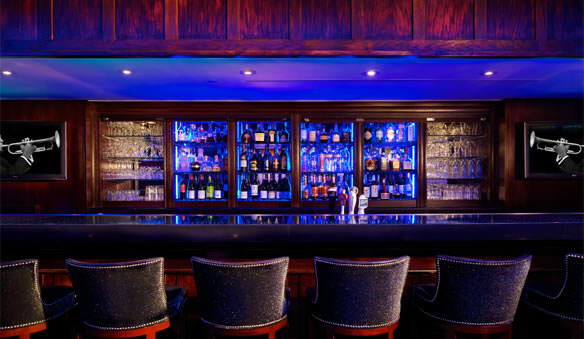 Today, guests flock to hotel’s aptly named Blue Bar7, where they can enjoy cocktails (such as the famous Dorothy Parker) and champagne while bathed in a subtle blue light. The interesting artworks and caricatures of Al Hirschfeld decorate the bar’s walls. There is also a $10,000 martini, known as “Martini on the Rock,” on its menu. This pricy drink was first purchased by a “Texan real-estate mogul”8 in 2004, who was proposing to his fiancée that evening. Since then, The Algonquin Hotel has been owned by big corporations, including the Japanese Aoki Corporation and the Camberley Hotel Company. Despite all the transitions in management, many things have stayed the same at the hotel, including its tradition of having a resident cat, hosting the creative elite, and of course being frequented by spirits. Some of these ghosts like to serenade visitors. One woman allegedly heard “I’m In The Mood For Love” while she was in the elevator, for instance. Though her husband and “fellow passenger”10 didn’t hear the ghostly tune, who’s to confirm that Vicious Circle songstress Dorothy Fields wasn’t in the car with them? Another Algonquin guest had the fortune of having two ghost run-ins. In one instance, “he was awakened by a tapping sound from the bathroom”11; in the other, he was followed back to his room by some spirit’s disembodied footsteps. Some of the hotel’s spirits prefer the quiet, though. 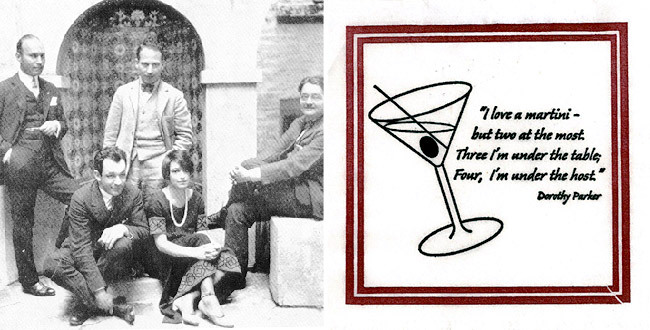 Poet Dorothy Parker reportedly once “shushed”12 a gang of children, who were being a bit too loud. Parker, who was later committed to a sanatorium, is also rumored to have tried to kill herself at The Algonquin. Unfortunately, Parker appeared to battle her troubled mind with alcohol. Many of her famous quotes express her love for drinking and have thus been stamped onto The Blue Bar’s napkins. Parker’s quotes are perfect for the bar’s napkins. 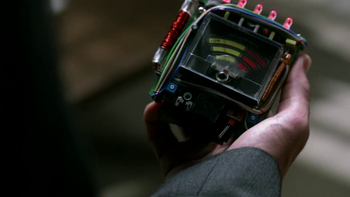 Look into any ghost hunter’s toolkit, and you are most certainly to find an EMF reader. Besides diagnosing wiring problems, these handy devices are perfect for picking up on some paranormal activity. And since Fusion gave The Algonquin Hotel a four out of five “ghost meter reading,” you can be sure that there’s more to the hotel’s scares than local lore and whispered rumors! Gawker journalist Kelly Conaboy also decided to experience the hotel’s haunting for herself. In October 201514, she booked a room at The Algonquin Hotel and chronicled her stay in detail. Now besides an EMF reader, she also brought with her two other popular ghost-detecting instruments: a crystal pendulum and an Ouija board. Now pendulums are more than just pretty stones dangling from a chain – they can be used to communicate with the dead. You ask a ghost a question, then base its response on the direction your pendulum swings. Conaboy, for instance, inquired to each of the thirty Round Table members “Are you here?” while holding her’s. 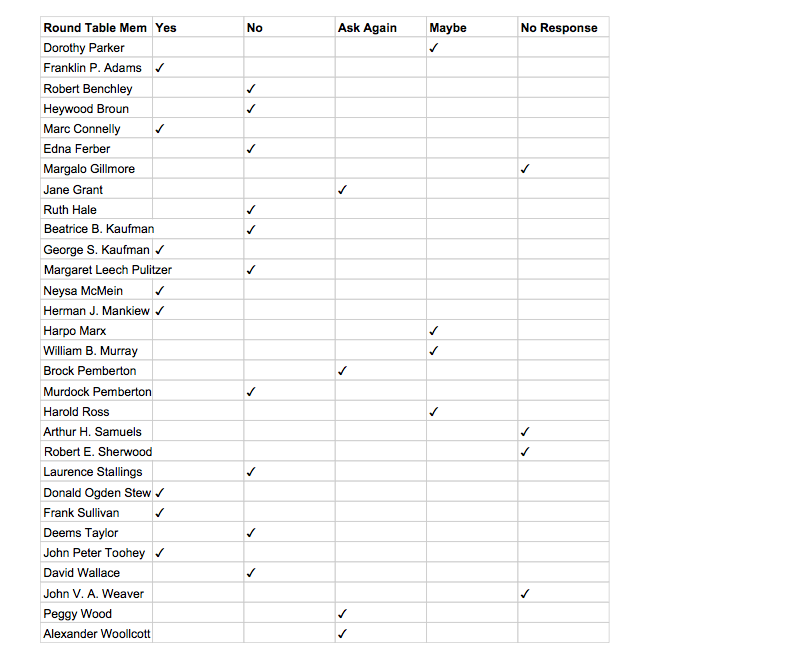 Twenty-six appear to have participated in her Q&A session. As you can see, some of the best literary minds most definitely are still present at The Algonquin Hotel. But they are not the ones haunting the building – The Algonquin has plenty of mischievous poltergeists as well. They’re known to disrupt guests’ bedtimes by loudly moving around furniture, and to send elevators to all floors. Thus, the hotel has another unique tradition, a sort of mini exorcism held on every New Year’s Eve15. Staff members dim all the lights and march through the building while banging on cookware, in hopes of warding off anything sinister. Outside the busy Algonquin Hotel. “Best wacky hotels: From haunted rooms to James-Bond approved.” NY Daily News. 10 December 2012. Web. 30 December 2015. Para. 9. “The Round Table.” The Algonquin Hotel, 2015. Web. 30 December 2015. “About the Algonquin Round Table.” Algonquin Round Table Mysteries, 2010. Web. 30 December 2015. Para. 2. Herrmann, Dorothy.With Malice Toward All: The Quips, Lives and Loves of Some Celebrated 20th-Century American Wits. New York: G. P. Putnam’s Sons, 1982. Page 19-20. Miller, Tom. “The 1902 Algonquin Hotel – No. 59 West 44th Street.” Daytonian in Manhattan. 21 April 2012. Web. 30 December 2015. Para. 29. “The Algonquin Cat.” The Algonquin Hotel, 2015. Web. 30 December 2015. “The Blue Bar.” The Algonquin Hotel, 2015. Web. 30 December 2015. Garvey, Marianne, Brian Niemietz and Oli Coleman with Rachel Maresca. “Texas tycoon proposes at the Algonquin Hotel with a $10,000 diamond-ring martini.” NY Daily News. 15 July 2015. Web. 30 December 2015. Para. 3. Martin, Douglas. “Mary Bodne, Ex-Owner of Algonquin Hotel, Dies at 93.” The New York Times. 2 March 2000. Web. 30 December 2015. Para. 4. 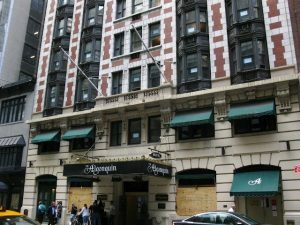 “Is NYC’s Algonquin Hotel haunted? One guest says so…” Oyster.com. 30 October 2009. Web. 30 December 2015. Para. 1. 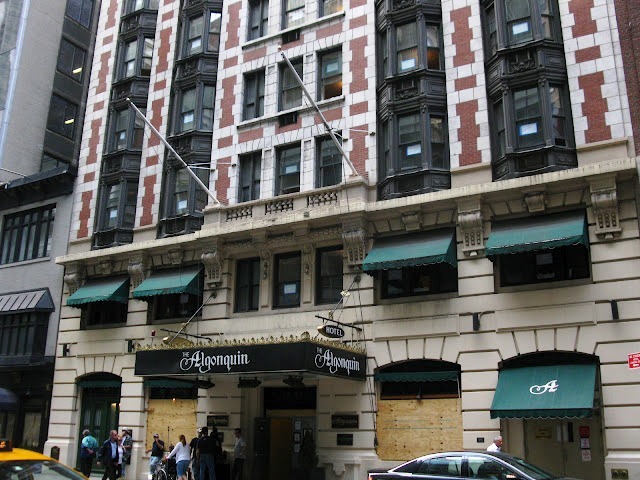 “Algonquin Hotel, New York, New York.” Haunted Hotels in New York. Hauntedrooms.com, 2015. Web. 30 December 2015. Para. 3. “6 Most Haunted Places in New York.” Blog.archerhotel.com. 2014. Web. 30 December 2015. Para. 7. Fitzpatrick, Molly. “Are ghosts real? We took a ‘ghost meter’ to some famously haunted locations to find out.” Fusion.net. 28 October 2010. Web. 30 December 2015. Para. 13. Conaboy, Kelly. “Specter Detector: A Night Spent Haunting the Ghosts of New York’s Algonquin Hotel.” Gawker.com. 2015 October 15. Web. Payne, Stefanie. 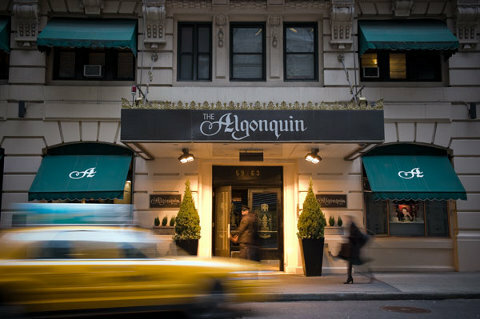 “The Algonquin Hotel Celebrates 5 Years As An Official Literary Landmark Today.” Business Insider. 2011 July 22. Web. 30 December 2015. Para. 6.